Today PlanPrescriber (www.planprescriber.com), a wholly-owned subsidiary of eHealth, Inc (NASDAQ: EHTH), published advice for Medicare beneficiaries interested in buying dental insurance. “Original Medicare” (Parts A and B) does not provide dental insurance coverage. 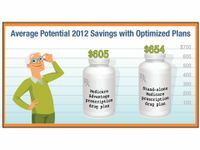 Only five percent (5%) of customers were in the Medicare prescription drug plan (PDP) with the lowest total out-of-pocket costs available to them, according to an analysis of more than 100,000 user sessions that occurred on PlanPrescriber.com during the 2012 Medicare Annual Enrollment period. Today PlanPrescriber published advice for Medicare beneficiaries who are considering taking advantage of the 2012 Medicare Advantage Disenrollment Period (MADP). The 2012 Medicare Annual Enrollment Period officially ended earlier this year on December 7, 2011, and one-in-five seniors (19%) on Medicare were unaware of the new dates. So, PlanPrescriber published seven tips for people on Medicare who missed the 2012 annual enrollment period and need advice on how to maximize their drug and health coverage benefits in the coming year. With less than two weeks left in Medicare's 2012 Annual Enrollment Period (AEP), one-in-five (19%) Medicare Part D and Part C enrollees over the age of 65 still does not know that the enrollment period is scheduled to end three weeks earlier this year, on December 7, 2011, according to a survey conducted by Opinion Research Corporation and sponsored by PlanPrescriber. The 2012 Medicare Annual Enrollment period is underway, and PlanPrescriber (www.planprescriber.com), a wholly-owned subsidiary of eHealth, Inc. (NASDAQ: EHTH), has published a list of seven questions most Medicare beneficiaries and their caregivers are asking when they get on the phone with a licensed eHealthInsurance agent. The Medicare AEP enrollment period opened on October 15, 2011 and runs through December 7, 2011. In most cases, Medicare beneficiaries who have a Medicare Supplement plan and wish to make changes to their Medicare Part D prescription drug coverage for 2012 will only have an opportunity to make these changes during the AEP. As baby boomers begin turning 65 and become eligible for Medicare, an increasing number will try to make sense of the numerous Medicare coverage options available to them, including the different types of Medicare Supplement plans and the specific Medicare enrollment periods for Medicare Supplement plans. Many will struggle to find the Medicare Supplement plan best suited to their personal needs. PlanPrescriber released a “Top 6 List” of things people should know if they’re considering enrolling in a Medicare Advantage plan during the 2012 Medicare Annual Enrollment Period. PlanPrescriber issued ten tips for Medicare beneficiaries seeking to enroll in Medicare coverage during the 2012 Medicare Annual Enrollment Period (AEP), which opened on October 15, 2011 and runs through December 7, 2011. In most cases, Medicare beneficiaries who wish to make changes to their Medicare Advantage or Prescription Drug Plan selections for 2012 must do so during the AEP.